Well it is cold here in Colorado, not Polar Vortex Cold but cold enough that we are all wishing for some sunshine and blue water. 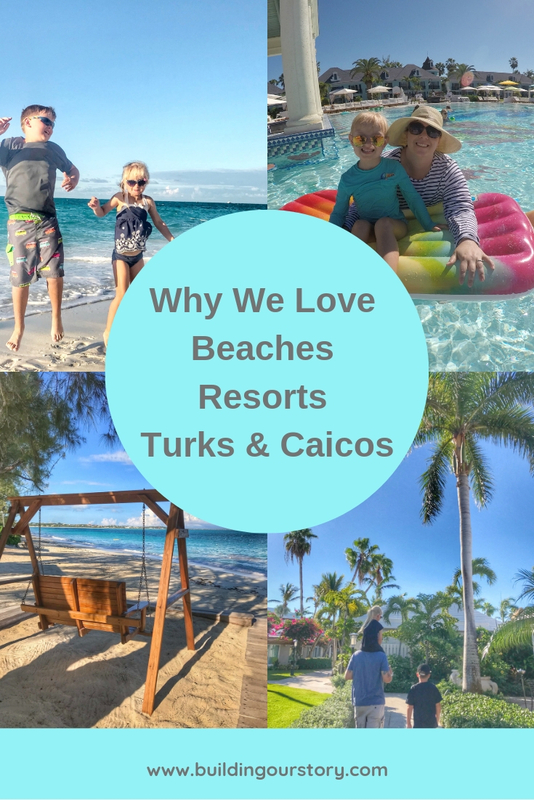 So, what better time to remind you all why we LOVE Beaches Resorts Turks & Caicos? Oh and I just want to look at our pictures to help warm me up! Our trip to Beaches Turks & Caicos for the Social Media on the Sand Conference was beyond amazing. It was an experience that will forever be an amazing memory for the whole family. 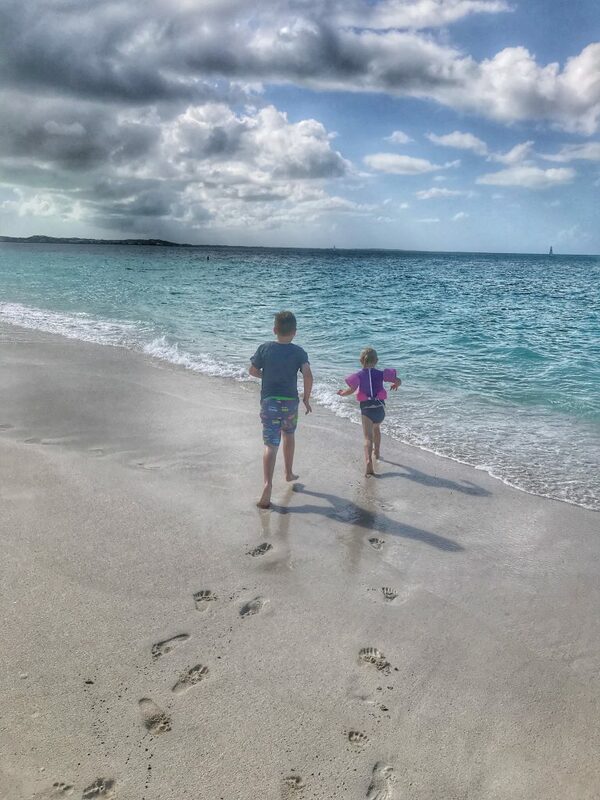 Exposing the kids to our favorite beach resort was a goal of ours and now we just want to go back again! 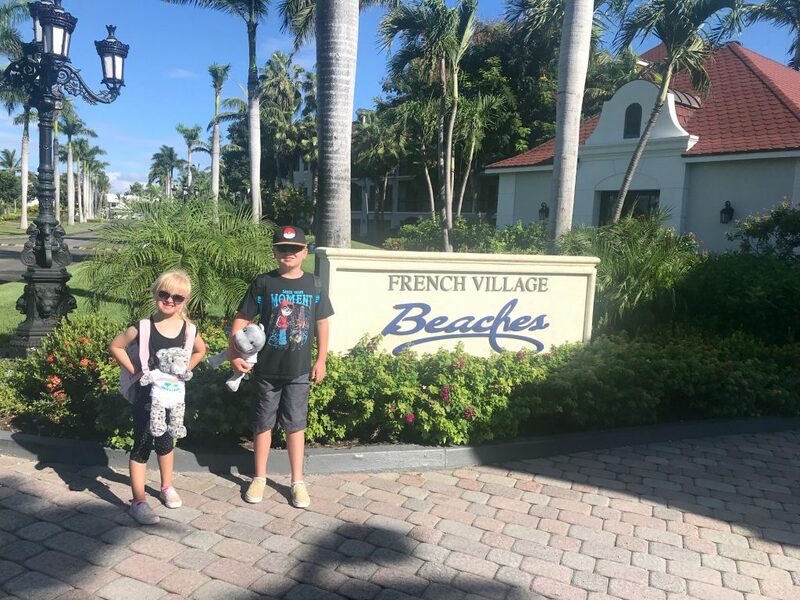 Our trip in 2018 to Beaches Resorts Turks & Caicos was our second trip to this particular resort. The first time that we visited we decided to leave the kids at home in the cold Colorado weather and enjoy a little adult only vacation with some bloggy buddies. That experience is still one of my favorite traveling memories. So much fun. When I got the invite to join the Social Media on the Sand conference for 2018 and heard that it was back in Turks & Caicos we knew we had to take the kids this time. I am so happy we did because enjoying this getaway as a family was just as great as enjoying it with friends. All of our experiences at Beaches Resorts have been pretty amazing when it comes to the rooms. For this trip we were in the French Village at Beaches Resorts Turks & Caicos. The French Village is the furthest from the beach, but very close to the kid’s club, teen club, and water park. From our room it was just a few steps to the water park. This section of the resort is quiet and also the cheapest. 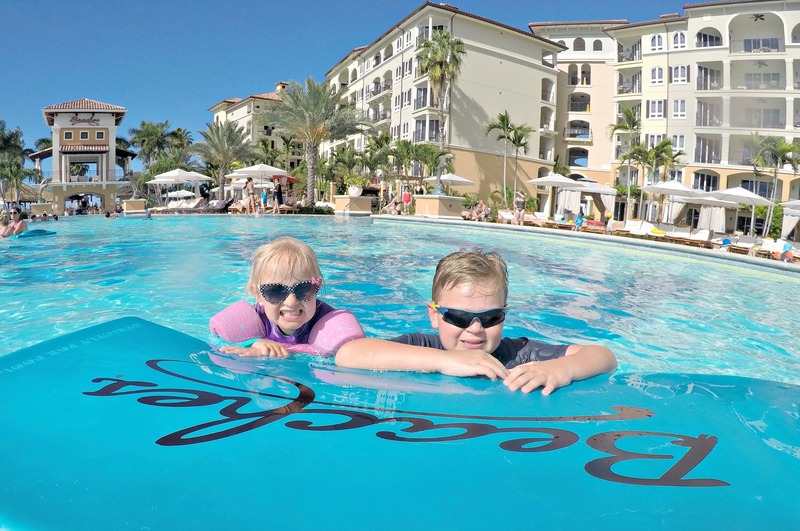 My kids absolutely loved this pool…mostly because of their personal swim up bar tenders – Jomo and Demiedra! They were fantastic with the kids and made the best drinks for them and for us adults. Caribbean Village – This village was the first to be built. Beautiful beach views, active and fun pool and fantastic restaurants nearby this is a perfect option for active families. Our first stay at Beaches Resorts Turks & Caicos we stayed in the Caribbean Village and really enjoyed it. Italian Village – Ocean views and the largest pool, this is the epicenter of the resort. The rooms are newer and big enough for families of 5. A few of our friends did stay in this village and said it was very nice and updated. This pool usually has fun family friendly games through out the day too! Key West Village – Staying in the Key West Village is a different experience than the other villages and is perfect for larger families or luxury travelers. The Key West village has a few smaller pools that are never crowded. Families can relax in the sun and play in the pools often alone. We have heard that this is the most expensive option but perfect for large multi-generational groups. 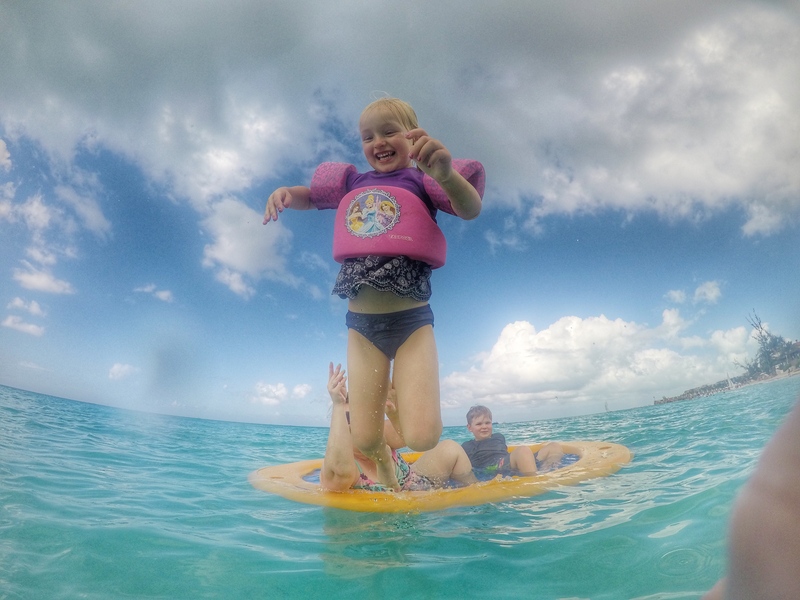 Our first experience at an all-inclusive was at Beaches Resorts Turks & Caicos. Honestly, after that experience we will never do a beach vacation any other way. We have all heard this before and honestly, I never really knew what it meant but seriously it means ALL inclusive. One part about this way of vacationing that I absolutely loved was that you paid all of your travel fees and room payments ahead of time. That scary bill at the end of your trip was nowhere to be found. I never felt like I should say no to anything while on the resort. Would you like dessert? Would you like to go snorkeling? Would you like another drink? YES, YES, and YES! A freedom of fun for everyone! Kids love any characters. Even though my kids have not watched Sesame Street for a few years anytime we would see any of the Sesame Street friends walking around we had to stop and say hello and ask for a hug. It was so fun to see them enjoy themselves. And honestly, I love seeing the characters too! On Teagan’s birthday we were able to experience a Character Breakfast with the Sesame Street friends. We danced, we sang, we ate and we took a lot of pictures. It was so fun and totally worth the extra cost – add this part of the experience to your itinerary, the kids will LOVE IT! We were living it up for those few days and that meant we were not only trying a ton of food but we were enjoying some fruity frozen drinks in the pool and on the beach and some fantastic wines while dining. 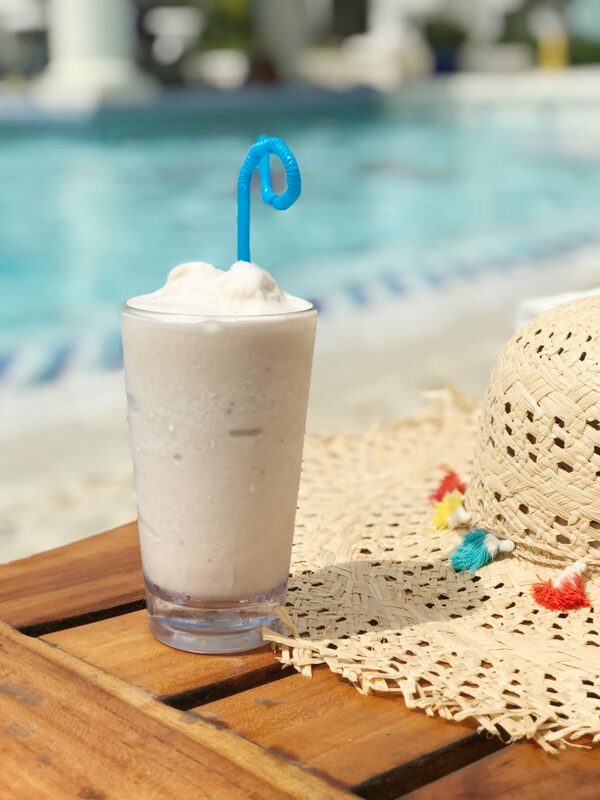 I will have to say that our favorite fruity frozen drink was the Dirty Banana – extra filthy! HA!! It was fun to order and so yummy! A must try if you visit. Like I have discussed before, the drinks and food are included. This gives you the opportunity to let loose. Responsibly of course. 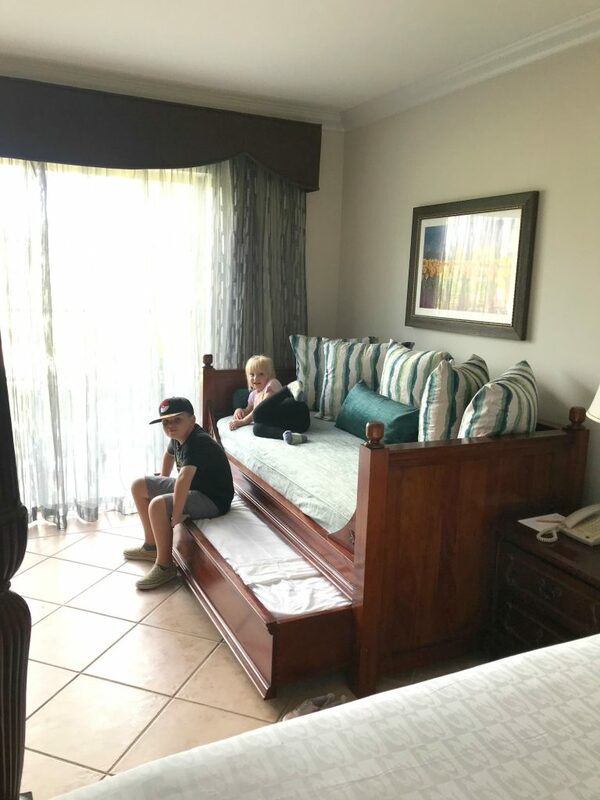 Now this trip was a bit different because of the kids but they loved the drinks just as much as we did – Rum free of course. With a choice of 21 international restaurants, the hardest decision will be which to try next. Even with our picky kids we were able to enjoy some great meals. Teagan, the picky eater, always found some favorites like chicken nuggets or pizza and absolutely fell in love with the chocolate croissants. Jude on the other hand was all about the seafood. This boy misses out on good seafood living in Colorado so anytime we travel near the ocean he enjoys it. The last day we were there for dinner he went big! We visited Schooners which is on the beach and offers regional cuisine. 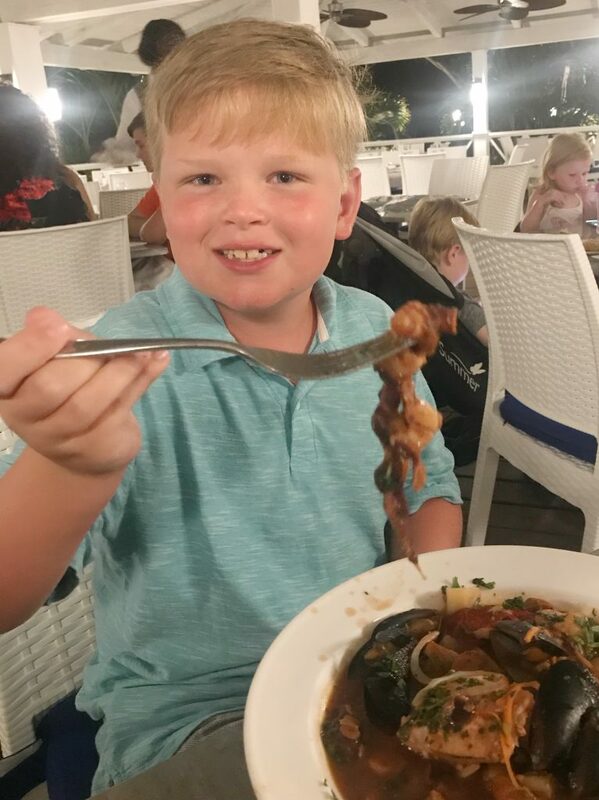 This boy decided he wanted to try all of the sea food so he ordered a big bowl of the Schooner Bouillabaisse. What is that you ask? Bloody Mary Broth, Shrimp, Mussels, Clams, Mahi Mahi, Baby Octopus, Chorizo Sausage, Fennel and Potatoes all in a nice hot stew. EEK! He was in heaven. He even asked for an extra helping of the Octopus when he finished. For those of you wondering, for people like me who are not big seafood eaters, yes there is PLENTY of food to choose from. No one will go hungry here! While I did not experience the Red Lane Spa while visiting Beaches Resorts Turks & Caicos I heard only amazing things about it. The reviews are fantastic and from what I can tell the spa is beautiful and the perfect place to step into a total quiet and relaxation state. Even if you do not experience the spa you will get to experience the Red Lane Spa line of shampoo, conditioner, body wash and hand soap as it is fully stocked and inclusive to your room! It is AMAZING!! So you may not be the beach type but guess what? There is literally something for everyone. Games, activities, relaxing cabanas at the pool that are perfect for reading, a water park, tons of beautiful pools and so much more. You will never find yourself bored while visiting Beaches. I have already thought about how this type of resort would be great for multi-generational family vacations. The kids enjoyed the pools more than the beach mostly because the salt water really bothers their eyes. A few days Jeremy took the kids to the kids camp and he went out and did some snorkeling, his favorite thing to do while at the beach. There are eight pools at Beaches resort in Turks and Caicos (not including hot tubs) and they’re all kept very clean. Some pools are better than others depending on how you like to spend your time. 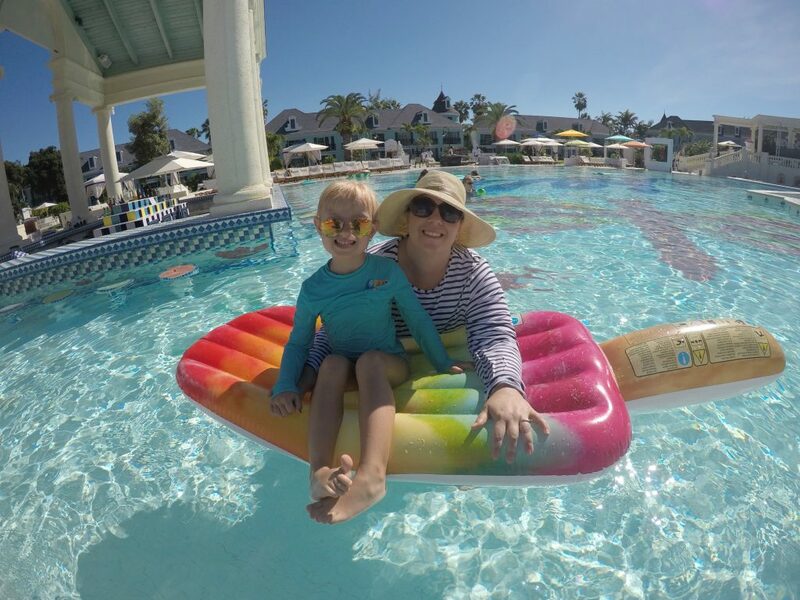 We enjoyed most of our time at the French Village Pool since it was just steps from our room but also visited the Italian Village Pool and Water Park daily. 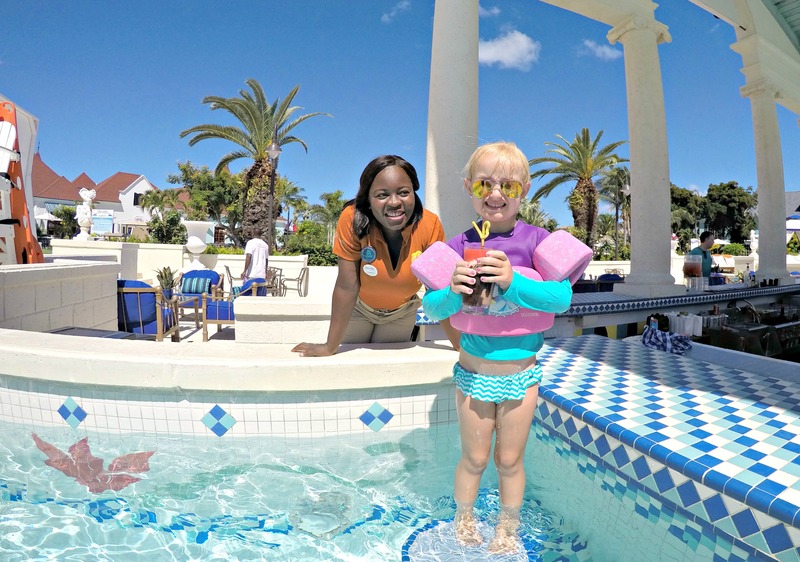 The kids did experience the Caribbean Village pool a few times with their camp as well. The French Village Pool is pretty quiet. The Italian Village is crowded and hopping! The Caribbean Village Pool is usually filled with kids wanting to splash and play. Our experience was a bit different since we were there for a conference with about 100 other influencers and their family but what was so fun was seeing the kids meeting new friends from all over the world. I only hope that Jude and Teagan get to meet up with their bloggy kids BFF’s again soon. 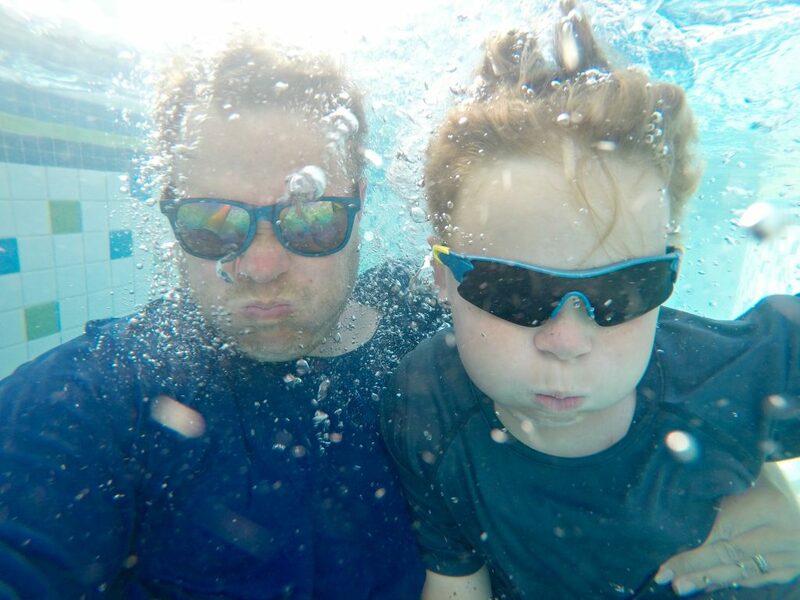 Make sure you visit these adorable little boy’s mom’s blog WHEN TARA MET BLOG! 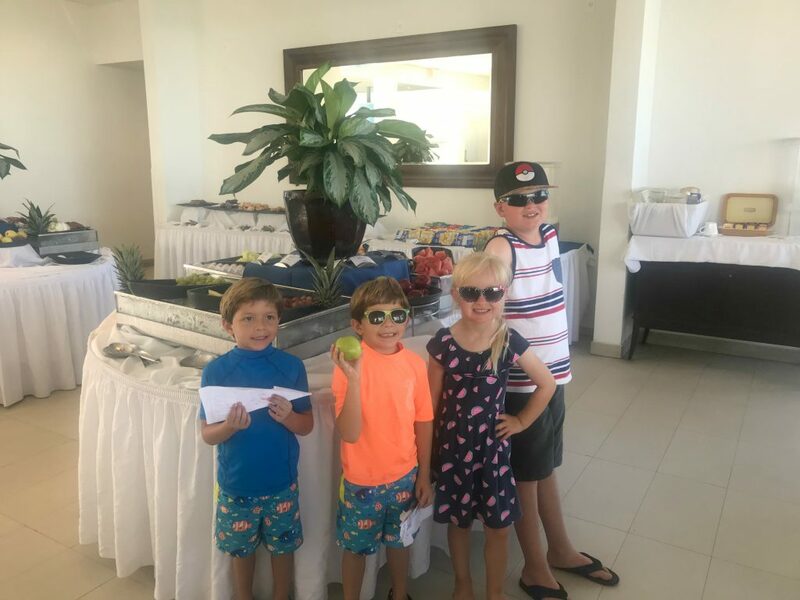 Even if we were not on the resort with a number of internet friends I think the kids would have made other friends as well since they absolutely loved going to the kids camp. 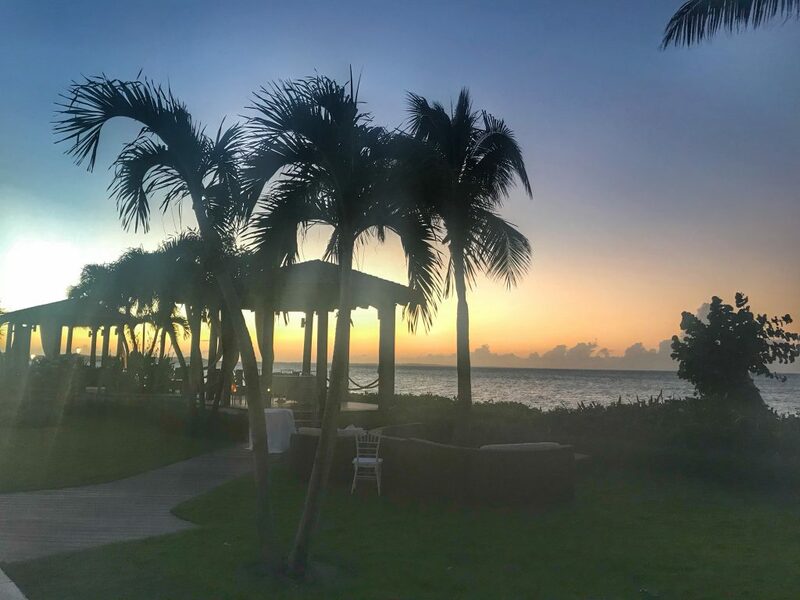 What is great about visiting Beaches Resorts Turks & Caicos is that while it is a huge resort that can accommodate a lot of guests we never feel totally overwhelmed or crowded no matter where we are. There is always enough lounge chairs at the pool and beach and you do not have to go to the pool at 7am to reserve a spot for the day. In addition, when eating at the restaurants we never felt like we had to wait too long for a table or food. All-Inclusive for the win!! Take a family vacation and get some adult only time built in thanks to the Kids Camp! At Beaches, they give kids extra attention with tailor-made fun just for them, offering age-appropriate activities for kids of all ages, from tots to teens. 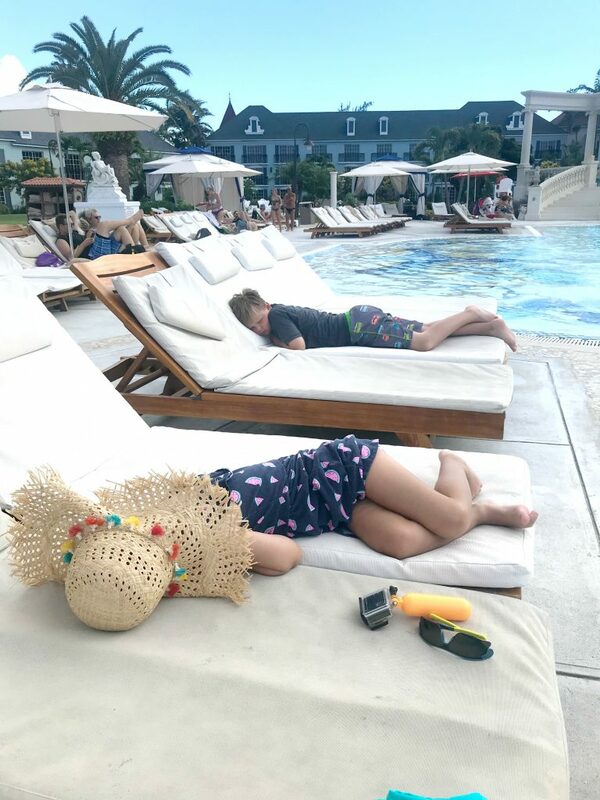 The kids are always supervised, and kids vacations are all-included. With a staff that’s so caring, it’ll feel like your kids are in the loving hands of a family member who just wants to spoil them. 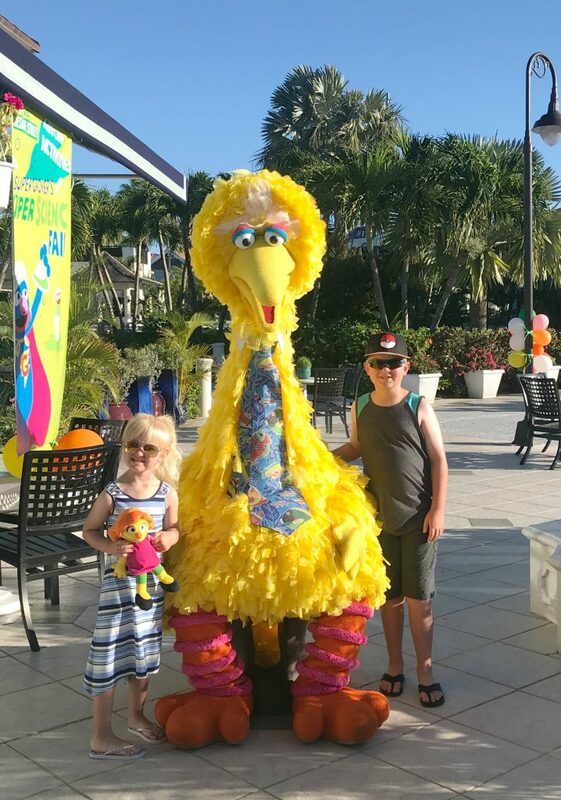 See our Review of Kids Camp at Beaches resort and make sure you check out our tips for taking your kids to Kids Camp too! We all Deserve A Little Fun! Escaping reality for a few days is a great way to come back to life refreshed and motivated. Leaving the stress of work, school, home life, bills, health, etc allows for us all to laugh a little more and love a little harder. When booking with Beaches Resorts your transfers to and from the airport are also included. You will be picked up at the door of the airport and dropped off with luggage in hand at your particular village. It is all coordinated so well. And on that day that you have to leave – BOO – they do the same for you. Your party is given a departure time and you wait in the very nice departure lounge until it is your turn to hit the road. One less thing to stress about during travel. Love that. Blue water that you can see through! All of the fish around us while we were in the ocean was a little creepy but wow, the colors and beauty was so worth it. The Caribbean blue water is nothing like the beaches here in the states. There is something so amazing when you first step onto this beach, the view and the colors take your breath away. Paradise. The staff at Beaches wants you to do nothing but have a great time. I was amazed at some of the things the staff helped us with. Each and every staff member we came in contact with was kind and helpful. There is something great about that – true customer service. Not only were the staff concerned with Jeremy and I having a good time but they all took some extra effort to make sure the kids were enjoying themselves as well. Jomo and Demiedra will always hold a special place in both Jude and Teagan’s hearts – I hope we get to visit them again one day! I just finished making our photo book for this family vacation and I cannot wait to let the kids see it. 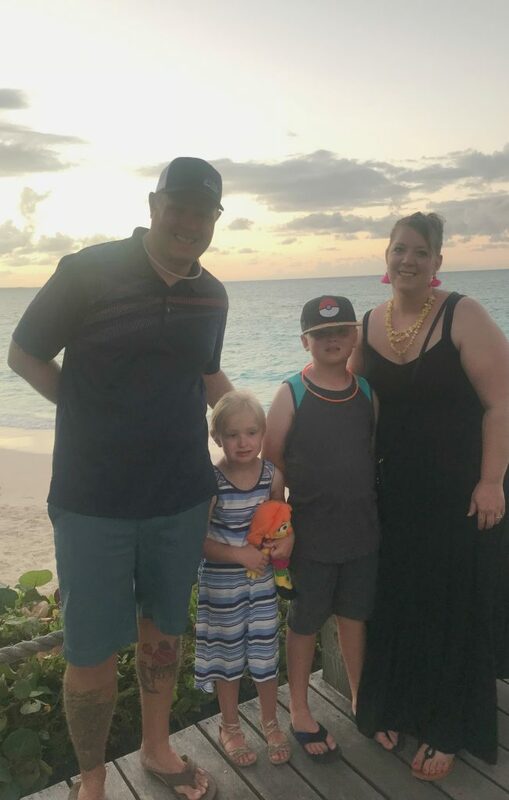 Even though it has been nearly 6 months since our vacation, the kids still talk about some of the things they loved the most at Beaches. Especially when it is super cold out! I know how blessed we are to have these moments and opportunities to travel with the kids and I hope we get to do more as the years go on. I encourage every family to find a special experience like this and enjoy some time away from the normal day to day stuff and enjoy some time away! 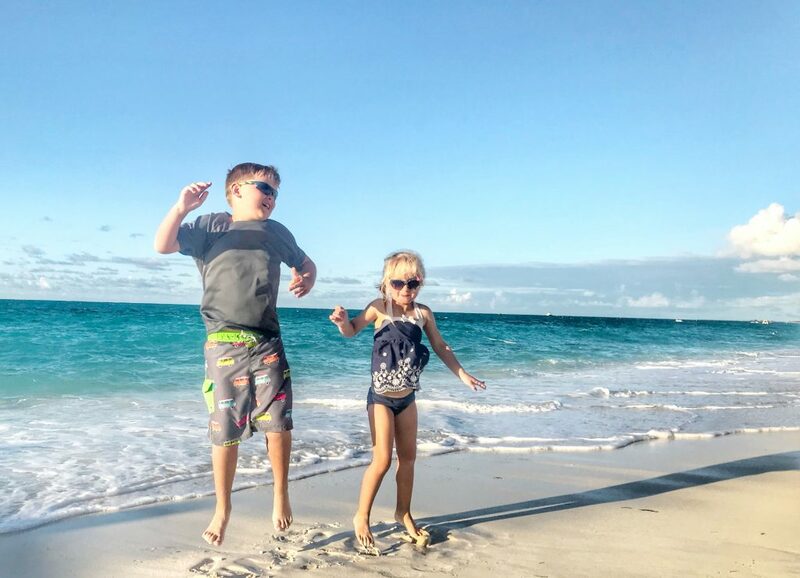 Dive into a one-of-a-kind, unbelievably exciting Beaches all-inclusive Turks & Caicos vacation for the whole family. A 45,000 square-foot waterpark; five magnificent villages, boasting the architecture and ambiance of Italy, France, the Caribbean and Key West; a 12-mile beach lapped by clear turquoise waters; endless fun activities for everyone, from tots to tweens and teens, featuring Sesame Street® characters, the Xbox Play Lounge and a sizzlin’ teen disco, Liquid at Beaches-all located on one of the world’s best beaches. With 22 dining options at 21 international restaurants, your most difficult decision will be which to try next. They have added even more restaurants to enjoy since our first visit! More on those delicious decisions later! Why You Need To Book Your Trip TODAY! 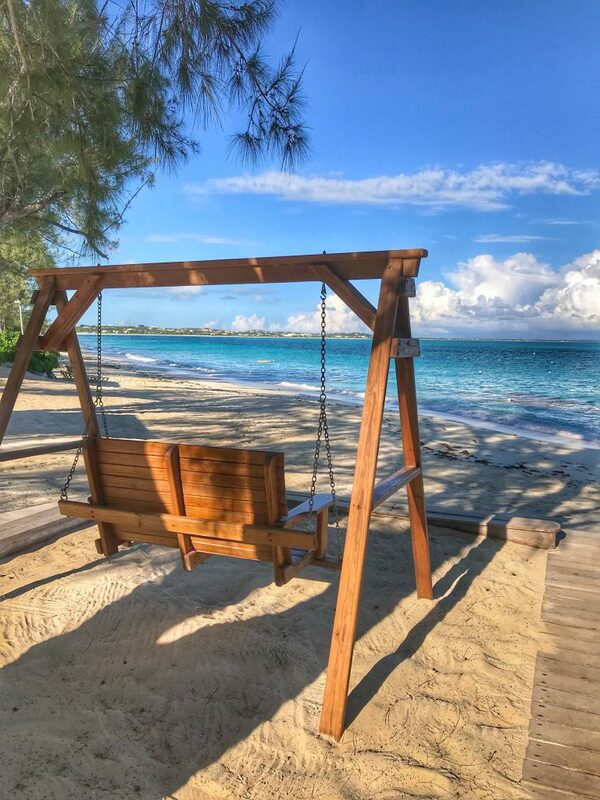 Beaches Turks and Caicos released updates on this property just recently and I must say, we are so saddened to read this update. They are indefinitely closing their resort in 2021! 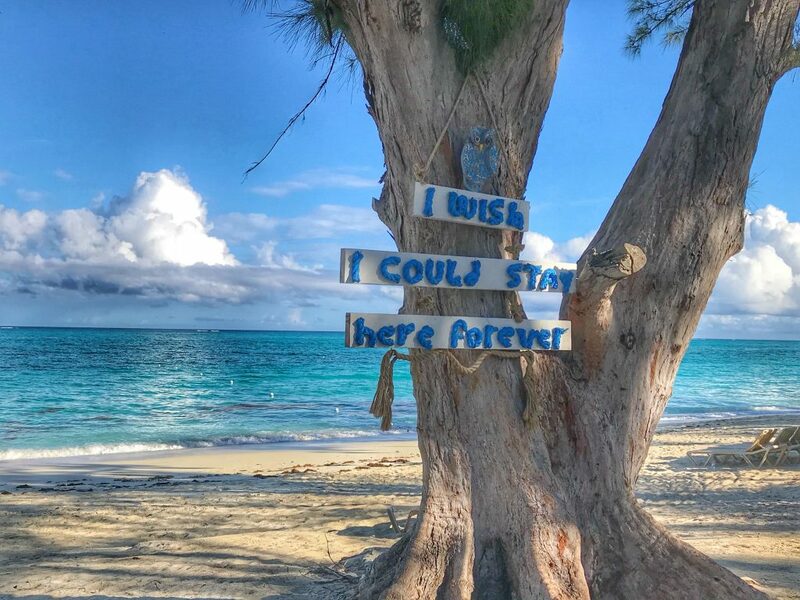 Yup it is the truth…this location will no longer be a destination all-inclusive resort as of 2021 – unless something changes between now and then. That’s why you NEED to book your stay quickly! In addition to closing in 2021, they have also provided intermittent closing dates for 2019 and 2020. Beaches Turks & Caicos Resort Villages & Spa will be closed from September 3rd to October 15th in 2019 and from September 7th to October 22, 2020. After reading this and seeing these beautiful photos I am sure it is not surprising that the kids are still talking about our trip to Beaches. While we have not booked our next trip back after seeing that they might be closing for good we are seriously considering another trip with the whole family. 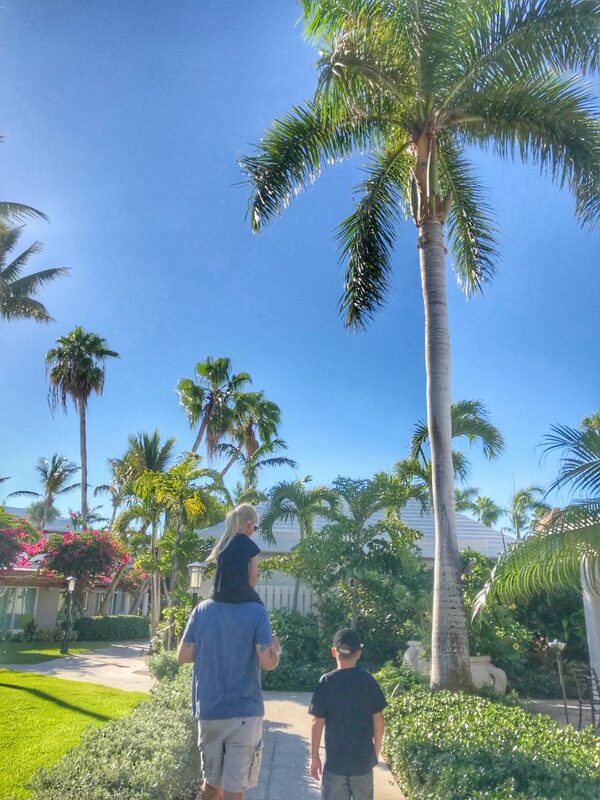 Would a trip to Beaches Resorts Turks and Caicos be a perfect family getaway for you? I received a discounted rate for my stay at Beaches Resort. All opinions are my own.